Please don’t get the wrong idea: that I condone routine herbicide use! However, cutting alone means repeating the exercise on Medusa’s new “snakes” the following year and ad infinitum. 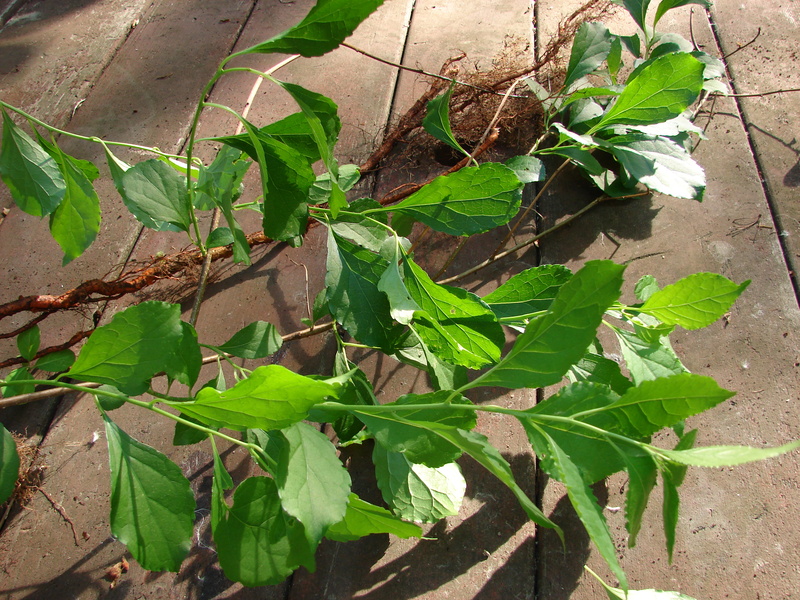 Even control by means of hand-pulling or with a weed wrench will need follow-up, because the brittle roots break off, and remaining roots will sprout. Because alternatives are absurdly difficult or time-consuming, one of the few herbicide uses that I reluctantly condone is to carefully apply herbicide (with a window paintbrush, not a sprayer) . Several Nature Conservancy chapters recommend triclopyr, the active ingredient in Brush-B-Gon and Garlon. Apply to the cut surface and adjacent bark of a vine cut less than ten minutes ago. This is possible when one works with a partner, one person cutting the vines, the other painting them (the “snip and paint” technique.) In dense vegetation, it also may help to scout ahead of time and tie colored flagging to the vines to be controlled. Use a substantial container that will not tip over easily, and wear gloves, long sleeves, and goggles. Based on my research, the only human health risk is eye-damage, if it splashes in your eyes. As for the rest of the environment, available data is too scanty to be confident of lack of harm; therefore careful application is important. However, we know an invasive woody plant infestation will shade out native plants, and reduce the food supply for wildlife. Therefore control by means of cut stump painting (within minutes after cutting) seems like the lesser of two evils. A better solution would be to keep sheep, for whom the Medusa sprouts of bittersweet are a delicacy, but zoning forbids this on most smaller properties. Note: I recommend that you check the product label and the active ingredient of any herbicide, insecticide, or fungicide you are considering using. Google the name of the ingredient, and databases like Extoxnet will come up. Look for the skull and crossbones symbol, the term “potential carcinogen”, and the list of types of organisms to which it is toxic, as a basis for your decision to use a product or not. Additional photos of bittersweet have been posted on a blog dated 5-23-2010. This entry was posted in Invasive Species and tagged apical dominance, Asiatic bittersweet, bittersweet, Celastrus orbiculatus, clonal, herbicide, invasive, invasive control, sheep, sprouting, triclopyr, zoning. Bookmark the permalink.